Lovely new kitchen. 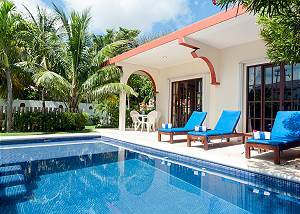 Sparkling pool, large yard with partial view of the ocean. Charming french doors let in the breeze. Free Wi-Fi. A/C throughout. Quaint Mexican decor. 1 minute to the beach and 15 minutes to town square.